Take control of your colors! With the TRUMATCH patented 4-color matching system, you have the visual tool you need for precise color matching on-press. A better way to select process color. The TRUMATCH 4-color matching system was designed by applying the logical organization of Hue/Saturation/Brightness (HSB) to process color. There are 50 hue families shown in the order of the spectrum, with 40 perfectly proportioned tints and shades of each hue plus a selection of 4-color greys -- over 2,000 colors in all. The smooth, precisely proportioned steps take the guesswork out of 4-color selection and matching. Just look for your desired color family and then find the right step of saturation and brightness. It's that simple. 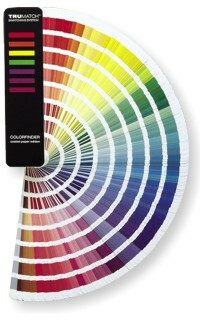 TRUMATCH Colorfinder fanguide is available in coated and uncoated paper editions. The digital, patented TRUMATCH System is the 4-color palette in all the leading software programs for graphic design and illustration from Adobe (InDesign, Photoshop, Illustrator, PageMaker, FreeHand), Corel (CorelDRAW), and Quark (QuarkXPress). The TRUMATCH System is endorsed by the 4-color experts, including Graphic Arts Technical Foundation (GATF) and Rochester Institute of Technology (RIT). TRUMATCH won the prestigious GATF InterTech Technology Award for Innovative Excellence.